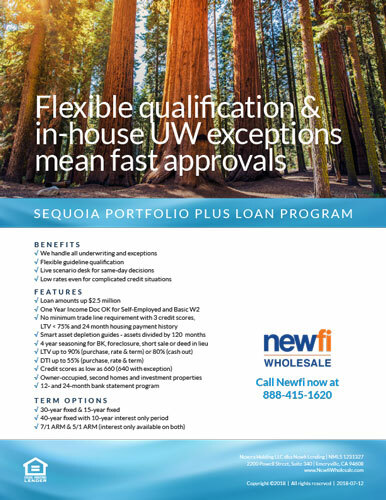 With Sequoia Portfolio Plus, we make all credit decisions and exceptions, providing flexible qualification and faster approvals. Say YES when others say NO with Sequoia Portfolio Plus! We control all underwriting, so we can tailor loans up to $2 million to a borrower’s unique income and asset circumstances. We underwrite the loan and make exceptions ourselves, so approval isn’t delayed by investors. Our lending specialists are on tap to quickly price scenarios and identify ways to qualify, making same-day exception decisions after loan submission. Even when borrowers have complicated credit situations, we strive to keep rates among the lowest in the market. What kind of borrowers are well-suited for Sequoia Portfolio Plus? Sequoia is especially good for using asset depletion income – one of THE EASIEST calculation methods in the industry! Income calculation can use funds coming from checking, savings stocks, bonds, mutual funds, retirement accounts, with $100k minimum needed to qualify as income. This simple formula equates to $833 per month in income per $100k in assets. Borrowers should have strong credit and personal financial strength to qualify for the best rates. Founded by industry veterans, we are a wholesale mortgage lender with deep expertise in jumbo, non-QM, and government lending. We are committed to providing our broker partners with a broad range of loan products, efficient technology, and an attractive price point to help them grow their business and close more loans. To learn more about Newfi Wholesale, call us today at 1 (888) 415-1620 or email us at support@newfi.com. What are the basic features of Sequoia Portfolio Plus? As a portfolio product, we can make exceptions to many of these criteria, provided there are compensating factors in reserves, income, or other areas. No minimum trade line requirement with 3 credit scores, LTV < 75% and 24 month housing payment history. See the Sequoia Portfolio Plus guidelines. To learn more about Newfi Wholesale’s diverse options for jumbo and non-QM, call the Newfi Wholesale team at 888-415-1620!